The cold seems to have been not so much a full-blown cold as a small tussle with the sinus gods. We had apparently angered them, but either someone else angered them more and they moved on, or we are mighty and they are wimpy, because we are all doing much better. Thank you for the good wishes. 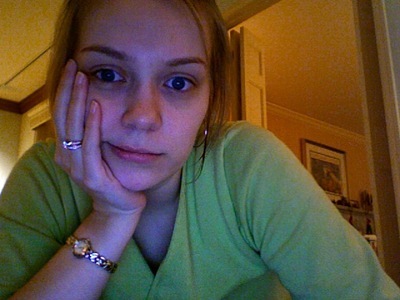 Meanwhile, I'm really regretting the fact that I don't have a way to share video here (we have a video camera, but no cable with which to transfer video to the computer) because the Muffinator has started "talking" pretty much constantly when she is awake. 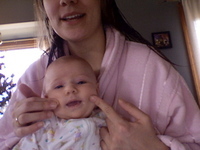 The sounds that come out of her mouth are nonsensical, but she clearly wants to communicate. Perhaps she is going to be verbally gifted like her Aunt Maggie, about whom the family joke is that she started talking at six-and-a-half months and hasn't stopped since. Or perhaps she'll simply babble a lot for the rest of her life. I know this is totally an "Is my child adorable, or is my child adorable?" moment. (I love Paul Reiser's quip about that: "Can you repeat the options? Because they sound so similar.") But I don't care. 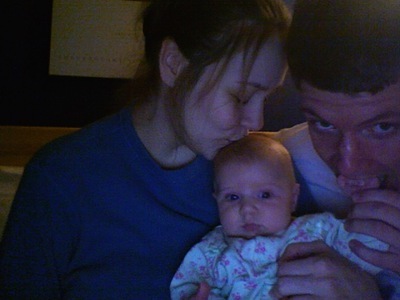 If you can't gush about your baby on your own blog, where can you gush? Did you notice that she's dressed up as a boy? We bought her a three-pack of thin sleepers because she'd been getting too warm at night. They worked beautifully, so we went back to get another pack, and they were out of the girl ones. So we bought the boy ones. One night last week Bryan brought her out of the bedroom where he'd been changing her into one of the blue sleepers, and announced, "Look! It's Phillip!" I've got no idea why he chose that name, but it has stuck, and now we jokingly refer to Camilla as Phillip whenever she's wearing her boy clothes. You don't think it will confuse her too much, do you? I would like to be clever or inspiring or (heck, why not?) both, but it is Cold City around here. I refer not only to the weather (current temperature: 15°F, feels like 2°F with wind chill) but to the state of my head, which is totally SUBAR (Stuffed Up Beyond All Repair) at the moment. The Camoodle's head is not exactly clear either. I am still in my pajamas, and the baby would be too if it were not for a ULI (Unfortunate Leakage Incident) with which we here at Chez Sinus greeted the morning today. But she is dressed comfortably in warm, fleecy pants, and I am dressed even more comfortably in Christmas-present pajama pants, and the two of us are going to treat ourselves to a day of rest and relaxation. I plan for it to include lots of tea, with milk for Milla (tea provided by Twinings, milk provided by me), a few Netflixed movies, a (very very) fluffy novel or two, and a thorough perusal of my brand-new issue of Cook's Country. Oh, and plenty of naps. Hopefully we will be feeling better tomorrow. Remember this post? 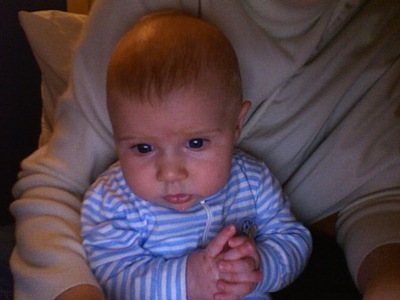 Where I asked everyone for advice about baby stuff, and you all kindly obliged? I loved reading all the comments, and I got some helpful suggestions, not least of which was the advice not to buy too much stuff ahead of time (we definitely didn't). And it's apparently very true what y'all said, that each baby/family will have their own set of things they find invaluable. Now that we're almost fifteen weeks into this parenting gig, I thought you might be interested in knowing what we've found the most and least helpful. Not that it will be the same for your baby or anything, but still. Fun to read, right? And now I have to go get in bed, because my baby? She won't sleep there without me. Another thing we could not live without: co-sleeping. Given the bagginess of the pants and the faux fur on the jacket, don't you think she looks like some kind of baby rapster? Who needs organized exercise when you've got a fourteen-pound baby who is fussy and insists upon being carried constantly? My mom told me that I should market the dance I do to put Camilla to sleep in the sling as a postpartum exercise video. And squatting to pick things up while holding the Muffin has my thighs in their best shape since I quit taking ballet at age sixteen. It drives me crazy when people (Vicki Iovine of Girlfriend's Guide fame not least among them) complain that pregnancy is actually ten months because forty weeks equals ten four-week months. Firstly, since a pregnancy is dated from two weeks before ovulation, a full-term pregnancy is thirty-eight weeks, not forty, since during the first two weeks of your pregnancy you're actually not pregnant yet. Secondly, a month is not just four weeks - if it were we would have thirteen months in our fifty-two-week year. We have twelve, which means a month is approximately four-and-a-third weeks, which means (wait for it...) that there are actually fewer than nine months of actual pregnancy in a forty-week pregnancy. (You can test this with a due date calculator: If you enter the first date of last cycle as January 1st, which would assume a conception date of January 14th, your due date will come out as October 8th: less than nine months later.) Whew. I feel better now that that's off my chest. Waffles taste just as good when you make them with soy milk rather than cow's milk. Apple crisp, on the other hand, is kind of weird when you substitute butter-flavored Crisco for butter in the topping. Oh, well - one out of two ain't bad. Bryan just called to tell me that the guys are coming a week from tomorrow to install our new countertops! I've hated the old, nasty counters in our kitchen ever since we moved into this house - they're probably about the cheapest kind you can buy, and look like they were installed by blind gorillas - and I'm thrilled about getting new ones. This is the pattern. Isn't it pretty? We're also putting in a new sink and faucet (because why not when the old ones will have to be ripped out anyway?) and I'm especially excited about the faucet, which is all fancy-like. I'll be cooking up a storm once all our new stuff is in. Our humidifier broke on Saturday night, and tonight we are absolutely getting a new one, because the last two nights have been horrible. Not just because I wake up feeling like I swallowed a ball of sandpaper, but also because the baby gets so thirsty that she wants to nurse constantly. Eight feedings last night between 11pm and 8am. No wonder I feel drained today. Today is the 34th anniversary of Roe v. Wade, and tonight we have the 10:00-10:30 shift in a round-the-clock rosary near the local abortion clinic. If you share my convictions about abortion, please say a special prayer today for its end. 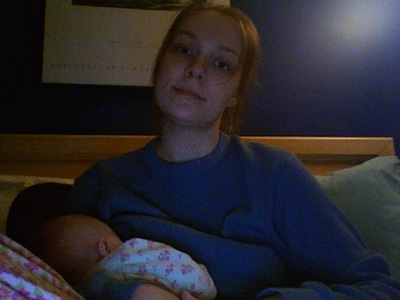 I'm writing this while the Muffin sleeps in the sling, and my back doesn't even hurt! Because the sling is not our old padded one, but the brand-new pouch sling that we bought on Saturday. It's a Kangaroo Korner adjustable pouch. I've heard good things about the fleece pouches, but decided to go with cotton because the Muffin is like a tiny furnace. So far this winter I've worn hardly any of my sweaters because carrying her around makes me far too warm. I love the new pouch; I can't believe how comfortable it is, and it's very lightweight and easy to use. Camilla-Billa (just one of her many nicknames) turned three months old on Sunday, and things just keep getting better and better. A lot of people have told us that making it through the first three months is the hardest part, and I am very willing to believe it. 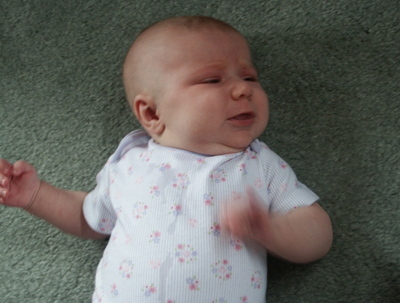 During her first months the Billa's default state was fussy, and now (wonder of wonders!) her default state is contented. She'll sit calmly on my lap during dinner or while I read blogs and email. I open my eyes every morning to the sight of her wide blue eyes staring at me, and when I start talking to her she kicks and coos happily. She "talks" to everything, especially to us, and we are completely at her mercy. Not that she's not still grumpy sometimes. 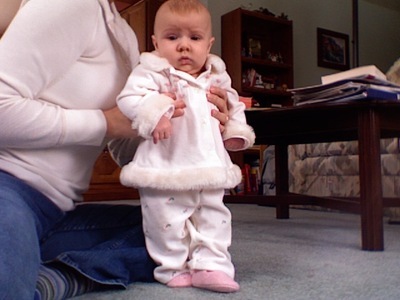 Of course, in this picture she's just mad that I dared to put her down and pick up the camera. Clearly a bad mother, I am. One thing I'm happy about is that the Muffinator (see! with the many nicknames!) 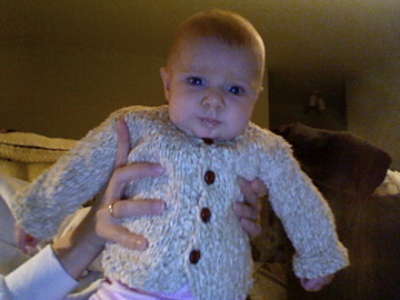 has stopped acting, when we change her clothes, like we're pulling her fingernails out one by one. When she was younger I would dress her in a sleeper each day and, barring leakage incidents, that would be what she'd wear for the next twenty-four hours, because I just couldn't stand the screaming. Now, I actually dress her in different outfits for the day. She's finally wearing clothes that people have given her. And looking darn cute in them, I must say. 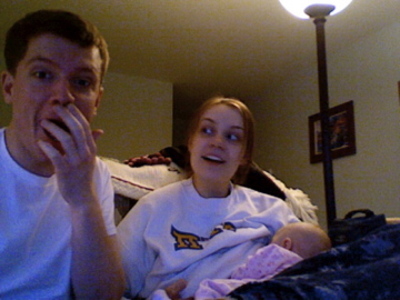 In this picture she's wearing this shirt from glarkware, which I find both hilarious and horrifying at the same time. 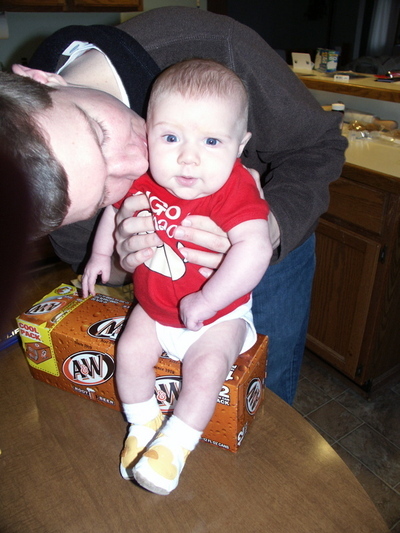 (Although I do definitely think my baby is the tastiest baby around.) It was a gift from my friend C, the same one on whose wedding day Camoodle (another nickname) was unexpectedly born. The shoes, which I believe I've shown before, are from Amy. The thighs are 100% homegrown. In other news, my husband is funny. Or at least he thinks he is. 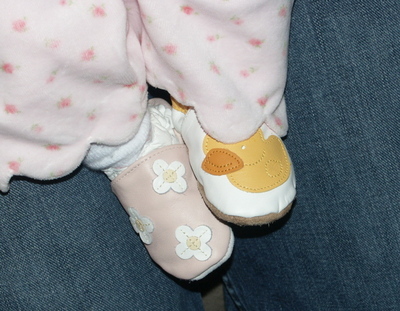 She was wearing both pink-flowered shoes when he took her into the bedroom to change her diaper. When he brought her back out, he pretended like he had no idea what we were all laughing about. Because, you know, she obviously changed her shoe herself. She likes ducks! On a more serious note, I'm grateful to have a husband who is such a loving and involved father. Were I to try to list all the things he does to make life easier and better for me, I'd be writing all day. He loves Milla-Billa and me so well; I could never possibly deserve it and I know I am blessed that I don't have to. It thrills me that I have decades with him ahead of me. It will thrill her too, I feel certain, when she's old enough to understand it. I've spent the last three months just coping, but I want to remember to cherish each moment as well. My baby will not always be this tiny, this helpless, this dependent. She will not always be so easily amused, so interested in everything. I will not always be able to comfort her so easily. The fact that I can now, well, that's just a little bit of a miracle, isn't it? 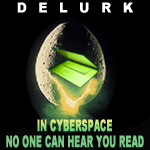 I'm thrilled that people are delurking! It's been really fun reading all the comments. I'm excited to try out the new cookie recipes, and thanks to your suggestions I have definitely decided to get at least one more carrier, although I have yet to decide what it will be. There is a local store that carries all things crunchy, including quite a few brands of slings, pouches, and wraps, and I'm planning on heading over there tomorrow to try out some of them and decide what to buy. Meanwhile, since you all were so kind to share your cookie recipes with me, here's my current favorite recipe. It's easy, and also very very bad for you, which of course means that it's unbelievably addictive. Mix 2 cups flour and 1/2 cup powdered sugar. Cut in 1 cup margarine or butter with fork or pastry blender until you have a crumbly mixture. Press into a greased 9x13-inch pan. Bake at 350 degrees, 15-20 minutes, until golden. Meanwhile, beat 4 large eggs. Mix in 2 cups granulated sugar and 1/3 cup lemon juice. Stir in 1/4 cup flour, 1/2 teaspoon baking powder, and 1/2 teaspoon grated lemon rind. Pour over hot crust, and bake at 350 degrees for another 15 to 20 minutes, until set. Sprinkle with powdered sugar and cool. Cut into bars, and try not to eat them all within a day. - Sometimes I use lime juice instead of lemon, or I use a mixture of the two. I think the mixture makes the most interesting flavor. - If you don't have lemon rind, you can skip it; the flavor will not be quite as good but the bars will still taste wonderful. - The crust and the filling both have a tendency to stick to the pan; I line mine with aluminum foil and grease that, making sure to have plenty of extra foil on the ends of the pan for handles. Then, after it has cooled, I just lift the whole thing out of the pan and put it on a cutting board before cutting into bars. Works like a charm. I'll let you know what I decide in the sling department. Kisses! It's Annual Delurking Week, and while I may forget to write about my own birthday (and quick perusal of the archives shows that I did indeed forget this past year) (it was August 23rd, in case you're wondering, and I turned 24), I will never miss Delurking Week, because I love comments way, way too much. More than comments, I love you (and you and you and you) and if you've been reading in secret, I want to know you. It will make me happy! Such a simple thing to do, and I'll be happy. So leave a comment, please! Because I know some of you might feel silly just saying hi without a concrete topic, here is something to talk about: carriers. I have a basic ring sling and an Ergo, and at this point we use the sling almost exclusively because the Muffin is too small for the Ergo without the infant insert and she is so over the insert, just put her in the sling already, gosh. But since she is now approximately 14 pounds, the sling hurts my back if I wear it for too long (like for an entire grocery store trip) and I'm looking for something to use until she's big enough to fit in the Ergo comfortably. Slings are not out of the question; the problem could just be the sling I have, which is a basic padded ring sling that my husband's aunt had someone make for us. I want to hear about any carriers you have really liked, and for what purposes and sizes of children they worked well for you. And if you are not into baby carriers or don't have children, I'm also collecting cookie recipes - cookies being one of the only treats for which you can consistently find dairy-free recipes - and would love to hear about your favorites. If neither of these topics interests you, talk about anything you want. Or just say 'hi' and be done with it. I'm easy; I just want to know you're there. 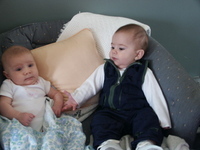 Man, life with a baby changes fast. To wit: this past week Camilla has gone to sleep before nine every night (except for last night, because I oh-so-stupidly had a small part of a muffin made with sour cream yesterday, thinking such a small amount of dairy wouldn't matter. learned my lesson, oh yes I did). Since she was about three weeks old we've had to wrestle with fussiness most evenings in order to get her down, but starting last Monday she suddenly started falling asleep very easily, and staying in that peaceful state until eight-thirty the next morning. She still wakes up every two hours to nurse during the night, but that is no big deal since she goes right back to sleep afterward. To say that things are better than they were would be an enormous understatement. Her handwriting is improving by the day. 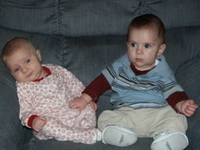 She thinks her cousin is a little strange, but she puts up with him. She still likes to nurse, and her dad likes to try to take pictures of the process, causing her mom to have to cover up quickly. 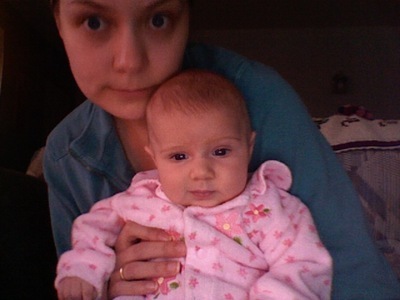 She loves to watch the computer screen while I'm using it, but refuses to smile at the Photobooth camera. Attempts to make her smile have been in vain thus far. Her gummy grins are pretty much the best part of my day. The celebration of the new year has passed, and after Epiphany this coming Saturday Christmas will be over as well. This means we can settle down in earnest to the important things. Like eating our delicious baby. 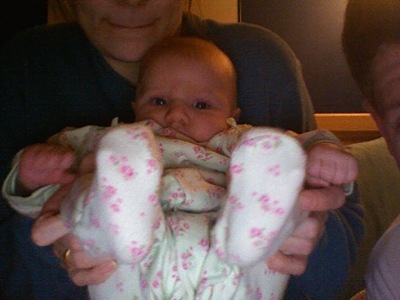 Seriously, Photobooth on the Mac is ten times more fun when you've got an infant to stare adorably at the screen. See? In a week and a half we will hit the three-month mark, and although I still feel tired and overwhelmed sometimes, things are getting a LOT easier. I've gone completely, completely off dairy, instead of just half-heartedly like I did originally, and Camilla's gas has pretty much disappeared. We haven't had to use gripe water in days. 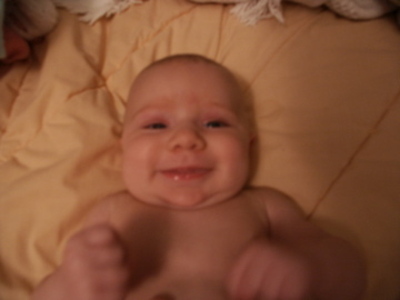 It's wonderful having a baby who is mostly happy instead of mostly fussy. When Camilla was a newborn I tried nursing her whenever she was upset, just like they say to do, but unless she was hungry she would never do it - in fact, she acted offended. She just didn't nurse for comfort. The day after Christmas I was telling my mom about this, and she agreed that it's fairly unusual to have a baby who will never nurse for comfort. So, of course, the next day Camilla started wanting to nurse all the time. This is different from her six-week-old growth-spurt eating; while she spends a lot of time nursing, she doesn't seem to have increased her intake. I'm actually pretty happy about this, since it's much easier to comfort her now, and I'm home with her all day anyway so it's no big deal. Speaking of nursing, I am so glad now that I stuck it out through those rough first weeks (not that I actually had it that rough, for I certainly never considered quitting, but I think first-time nursing can't really be easy for anyone at the very beginning). Because I love it now. It never hurts, Camilla has a top-notch latch; I can nurse lying down, which helps me sleep a lot better; I can nurse in public (thanks in part to my great nursing tank tops). Best of all, I get so many chances every day to hold my daughter and bond with her. Bellissima. I know I am blessed to be able to stay home with my daughter. 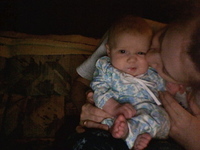 And I am blessed to stop writing this post now, as she has awakened from her nap. A happiest eleventh day of Christmas to every one of you.